All trustees have Personal and Unlimited liability if accused of negligence or breach of trust. Unless specifically allowed for in the trust deeds a trustee cannot be reimbursed for such misdemeanours or legal expenses from the trust. 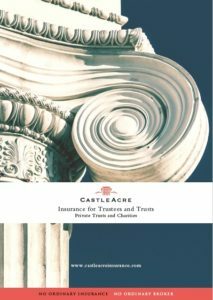 Until recently it has not been possible to find insurance which offers comprehensive financial and legal expenses cover but Castleacre have developed a specific policy working with one of our insurers to help protect trustees.